Nsemia Inc. Publishers announces the publication of The Gusii of Kenya: Social, Economic, Cultural, Political and Judicial Perspectives by John S. Akama. 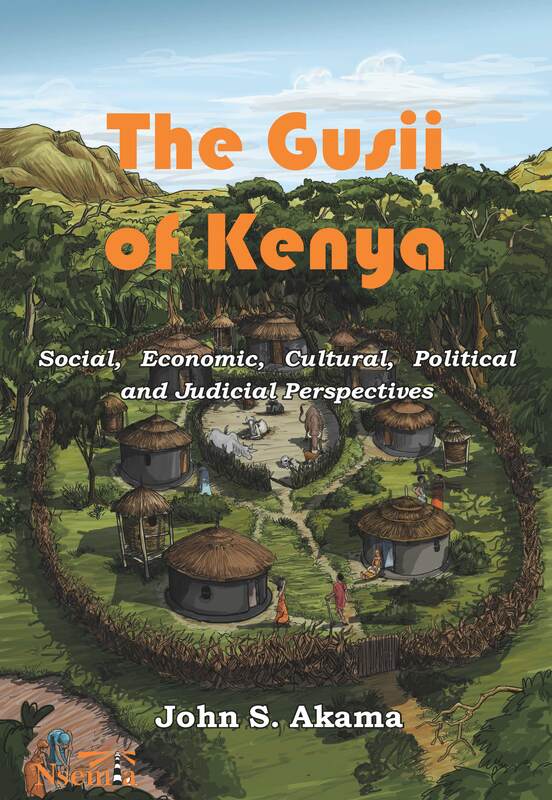 The Gusii of Kenya: Social, Economic, Cultural, Political & Judicial Perspectives provides in-depth topical insights of the Gusii (also known as the Kisii) of Kenya. The book captures historical aspects of the Gusii and how they ended up occupying their present lands. It enunciates the group’s cultural, political and economic organization that underlie the group’s identify and overall survival. Reading the book provides understanding of some noticeable elements of these perspectives that persist to date. Cultural aspects, such as rites of passage and weddings, part of essential elements of identity of a people, are well articulated. Social organization, starting at the homestead to clan and community levels, was intricately woven to form a coherent whole that defined the Gusi i character. This also formed the basis of key elements of the Gusii code of conduct (chinsoni) and justice as traditionally administered. The book also raises a number of questions regarding the character of the Gusii such as lack of central authority and the implications this has had on the community’s development over time. One can only speculate on the trajectory of history that would have been had the Gusii organized themselves differently. “The fate of the traditional cultures in Africa hangs in the balance due to the frontal attack by the forces of Westernization and the increasing passing away of the living encyclopaedias, the elders. As the author points out, some of these cultures are yet to be fully documented and yet today they are as relevant as they were in the past. Hence, he documents the pre-colonial Gusii culture and demonstrates its value in attempting to understand the dynamics of the modern Gusii community. It is for this reason that The Gusii of Kenya is a most welcome addition to the cultural history of the Kenyan peoples.” – Godfrey Muriuki, Professor of History and Archaeology, University of Nairobi, Kenya. “Prof. Akama convincingly argues that the Gusii, even as they have changed over the years, have retained their distinct Bantu identity despite intricate interactions with diverse ecological and social typologies consisting of predominantly Nilotic neighbours including the Luo, Kipsigis and Maasai and, following colonialism, European influence and other global impacts The book offers well-researched and analyzed themes, including the historical evolution of the Gusii; their movement and settlement in the Gusii highlands; the Gusii demographic evolution; the community’s social organization, administration of justice and law enforcement, indigenous educational system, initiation ceremonies, customary marriage, agricultural systems, and very significantly, their indigenous medicine. …. This is a very informative book with valuable scholarly contribution.” - Peter Odhiambo Ndege, Professor of History, Moi University, Kenya. “The Gusii of Kenya is a major addition to the knowledge base of Kenyan identities and a major contribution to understanding Kenya’s peoples.” – Matunda Nyanchama, Publisher.